You might say I'm on a sort of cute holiday treat kick lately. For the last several years, my family and I always bake and decorate individual bunny cakes for Easter dessert. Then recently I discovered the cute turkey cupcakes that I made for Thanksgiving. And now, we're on to Christmas and there are so many ideas for cute holiday goodies. This past weekend I made about 80 pretzel snowmen for my neighborhood cookie/candy exchange. John and I stayed up late two nights in a row dipping pretzels and decorating them. We had fun doing it and I can only imagine the fun (and mess) once Stella is old enough to join us. Directions for pretzel snowman: Dip a large pretzel rod in melted white chocolate. You'll need a spoon or knife to spread the chocolate about two-thirds of the way down. Lay the coated pretzel on wax paper, then add mini chocolate chips for eyes and buttons. Using a kitchen shears, cut a small carrot-shaped piece from a candy orange slice for the nose. When the chocolate is dry finish the snowman off with a couple pieces of Twizzlers Pull-and-Peel Strawberry Licorice for a scarf. Also, check out more cute treats that showed up at the cookie exchange. I think they're all adorable and I can't wait to try making them. The first is a little mouse. I don't have detailed directions for making it, but I can give you the ingredient list: the bottom is half of a Double-stuffed Oreo, the body is a chocolate covered cherry, the head is a Hershey's kiss and the ears are slivered almonds. Melted chocolate holds everything in place and red and green decorating gel add the finishing touches of eyes and a little holly leaf. The santas, snowmen and reindeer below are way too cute! I will post the ingredients/instructions for them as soon as I have them. These are all great projects for an assembly line so it's fun to involve more than one person. Kids will not only love to make them, but to eat them too. Last month I mentioned in a post that I overheard a lady in the fabric store talking about sewing Christmas-themed pillowcases to wrap her grandchildren's gifts. I loved the idea, not only is a pillowcase perfect for wrapping odd-shaped gifts, but it's also practical. Since I don't have a sewing machine (yet), I can't sew pillowcases, but I can buy them and decorate them, right? Right! I found some cheap white pillowcases at Target (two for $5.99) and used some of my trusty fabric paint from my Thanksgiving handprint turkey project. I found a cool (and free!) Christmas tree light font online and printed out each child's name on regular printer paper in a giant-size font. I taped all the pieces together and inserted them into the pillowcase along with the words "Merry Christmas". The black ink on the paper was clearly visible through the pillowcase so I could use it as a guide for painting. I let the paint dry overnight, dropped in the gift, and used a ribbon to tie it closed. It's a fun and easy project and a cute way to add a little Christmas touch to any bedroom once the gift is unwrapped. It's likely this Christmas will not be the end of my pillowcase wrapping, I'd venture to guess it might just become a tradition! I mentioned earlier that I was going to start a new family tradition and make a Thanksgiving apron with turkey handprints. As it turns out, I decided to upgrade the gifts for each Grandma to a tabler runner. I thought their aprons might fill up with handprint turkeys rather fast (given the number of grandchildren) so we needed something larger to work with. I had to run to a lot of stores to find table runners that would work, but after lots of shopping, I found plain (on both sides) gold table runners at Target that were perfect. I bought one for each Grandma. On Thanksgiving morning we painted up Stella's hand and attempted to make a handprint turkey for Grandma C's table runner. Needless to say, keeping a 4 month old's hand open is kind of tricky. The colored feathers all blurred together and the turkey resembles a kind of brown blob (sorry no pictures). Oh well, that will bring back memories each year of her little clenched hand covered in paint. We're still waiting for Ruby to come to Madison for Christmas so she can add her handprint to the runner. A few days after Thanksgiving we celebrated the holiday at my parents house and with five grandchildren there, we were able to add five handprints to Grandma G's table runner. I have to say, the second time around went more smoothly for Stella's handprint. (One adult holding the fingers open, one applying the paint and a third to assist with any squirming.) All the other handprints turned out great too! I can't wait to see how it looks in a few years after we've added more turkeys. I think it will be a fun addition to our family Thanksgiving celebration. I also made a whole rafter (yes, that's the proper term for a group of turkeys) of turkey cupcakes. They turned out cute and yummy too! I took the short cut and used a mix and pre-made frosting. I made German chocolate cupcakes with coconut pecan frosting. I used toasted-coconut marshmallows from Jet-Puffed for the head, a gummy fish for the beak, two chocolate sprinkles for eyes and candy corns for tail feathers. The turkey cupcakes are a great alternative to pumpkin pie for those of us that think that the best dessert is a chocolate dessert! I don't know if you've noticed, but cupcakes are all the rage lately. (Wikipedia claims the cupcake craze started in the 1990's, but here in the midwest we didn't find out until we hit the new millenium.) It used to be that cupcakes were just a kid's treat, but they've taken a giant step up to become a gourmet food. There are entire bakeries devoted to the sweet mini cake, and both professional and home bakers are now creating miniature works of culinary art. I think making and decorating cupcakes is a great activity for kids and adults. There are both simple and complicated decorating ideas for almost every holiday and season. I absolutely fell in love with the turkey cupcakes that my friend Anne made for a girlfriend get-together yesterday. She told me about two great cupcake books, Hello Cupcake and Martha Stewart's Cupcakes with all sorts of decorating ideas. Next time you're looking for a unique and tasty treat to make, try cupcakes, even better yet, make it a tradition. Yesterday when I was waiting in line at the craft store to get my fabric cut I eavesdropped on the conversation of the woman in front of me. She was buying several yards of cute Christmas fabric. She told the clerk that every year she sews her grandchildren pillowcases and then uses them to wrap their gifts. What a great Christmas tradition! Personally I hate wrapping gifts, I'm definitely more of a bag lady myself. But now I think I could occassionally find myself a pillowcase lady. I'll have to see if I find any cute pillowcases on sale. Or maybe I could even sew them. I'm taking a beginner sewing class next week and I'd have to guess that pillowcases are easy enough that even a beginner could do it. I'll keep you posted on my progress. I made a trip to Joann's today to pick up things for two projects (more info later). Boy, that the craft store is sure a dangerous place for me. There are a ton of things on which I could spend lots of time and money. Given that fact, I was amazed that I got out of the store with only a few more things than I actually had on my list. The first project on my shopping list was fabric. I was so happy that I found the exact color of microfiber (raspberry) I was looking for AND it was on super sale. The fabric will be used to create curtains in Stella's room. She already has a cute valance and blinds, but I think too much light comes in during the day making it difficult for her to nap, plus the curtains will keep out any cold that might come in through the window this winter. The Pottery Barn Kids catalog that arrived this week has some adorable snowman sheets that are perfect for creating a winter-themed bedroom. Wouldn't it be fun tradition to change the sheets in your child's room, your own room, or maybe the guest room to match the season or the holiday? I'm not talking about going crazy with a dozen sheet sets or anything and I don't think it's necessary to cover all the holidays or seasons, but covering some of the big ones would certainly be easy and fun to do. I received the Pottery Barn Kids catalog this week and what do you know, they're talking about holiday traditions. One of the traditions that they highlight is having kids leave a note in their Christmas stocking for Santa. Sounds like a great idea to me and a good time to take thank Santa for all the gifts he's about to deliver. This tradition and the PBK catalog reminded me that I need to find a Christmas stocking for little Miss Stella. I would like to find something special that she'll have for many years to come. I'm also trying to figure out if John and I should both get new stockings too so all three of ours will match. It's so hard to decide what I want, there are so many cute options from which to choose. 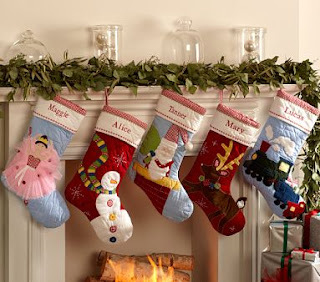 The Pottery Barn catalog has some nice stockings that can be embroidered with our names, and the stores are full of lots of options too. One other thing I'm considering is finding someone to make our stockings. Etsy is full of great handmade Christmas stockings. Now I just need to make up my mind, it will be time to hang the stockings on the fireplace before I know it. CafeTraditions.com reader Christina submitted a new birthday tradition that I have never heard about before but that I hope to introduce into our family this summer when Stella celebrates her first birthday. The tradition is using a birthday ring. For those of you, like me, that have not heard of a birthday ring, it's typically a wooden circle with 12 or 16 holes. The holes are filled with a candle to represent each year (similar to candles on a birthday cake), the rest of the holes are filled with small wooden figures or cut-outs. When the tradition was submitted, I quickly did a few searches to find out more about the tradition. It seems to be an old European tradition that originated in the Waldorf School. I also found a few blogs that told more details about their birthday ring traditions. Visit the following blogs for more information: Uncommon Grace and The Wonder Years. I found a great idea on "Homemakers with Hope" that I want to try when Stella is old enough. Not only would this be a great Halloween tradition, but it would work for other holidays as well. The idea is to have a fun holiday-themed breakfast on Halloween morning. 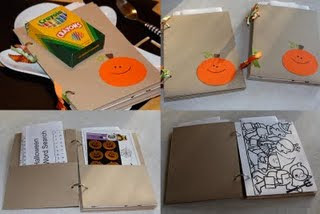 Bring out your themed dishes, decorate the table with pumpkins and Halloween placemats, serve Boo-Berry, Franken-Berry or Count Chocula cereal, then put together an actvity pack filled with coloring sheets, word finds, mazes, etc. Give the kids a new box of crayons to work on all the activity sheets. Click over to the "Homemakers with Hope" blog to read more. ABC Teach - great projects including craft ideas, coloring sheets, mazes, word search, word scrambles and more. Halloween scrambles, matching games and more. Kaboose - a wide variety of activity sheets available. PapaJan - many Halloween-themed coloring sheets. Teachnology - worksheets and lessons. edHelper - puzzles, games, activity sheets and much more. This past weekend my Mom and Dad came to visit. When my Mom walked in the door I saw she was carrying my favorite Halloween decoration, a ceramic witch she hand-painted when I was very young. The witch has been displayed at my parents' house each Halloween for as long as I can remember, and she thought it was time to hand it over to me so I could display it in my own home. My Mom painted the witch in 1975 when I was five years old. She made me a witch costume for Halloween that same year and the ceramic witch was painted to match. That Halloween I had my photo published in the local paper wearing my witch costume and bobbing for apples. Every October since when the witch is taken out of storage, I remember back to that particular Halloween. I don't remember the details of any other Halloween from my childhood as vividly as that one, but that painted witch helps me remember some of my favorite memories from my childhood and will certainly lead me to tell the story to Stella each Halloween for years to come. If I'm lucky, my Mom will make Stella her own witch costume in a few years so she can make her own Halloween memories. It seems like the ceramic witch has helped to create a few family Halloween traditions. I found a great Advent calendar in the last Pottery Barn catalog I received. The calendar inspired me to look for ideas to make an Advent calendar like my Mom had made when I was a child. 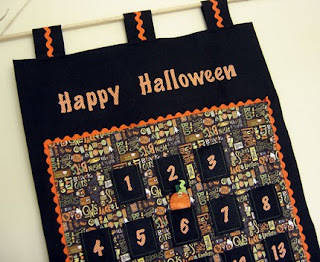 While searching online for ideas, I came across an absolutely awesome Halloween Countdown Calendar. While there's not time enough to buy one or make one for Halloween this year, I love the concept. I had never heard of such a thing, but I think it makes for one great Halloween tradition. I'm sure kids will love counting down the days until they get to trick-or-treat. One of the calendars I liked best can be found at Everyday Celebrations. It's a great inspiration for making your own, or if you're not up to the task, she also makes and sells them on Etsy. I can't wait to try this next year. 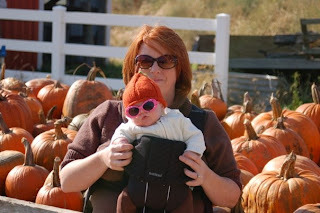 This year we made a trip to the pumpkin patch with our own little pumpkin. (Complete with pumpkin hat and all!) Of course, I plan to make this one of our annual traditions. It's a great way to spend a beautiful fall day. I have a confession to make though about the visit this year. We left without buying a pumpkin because the line to weigh and pay was waaaaay too long and our little pumpkin was ready for a nap. I'm sure that's the last year we get away with those shenanigans... next year she'll be big enough to wonder why everyone else is taking home pumpkins and she's not. A trip to the pumpkin patch is a tradition that many families share during the fall season. My sister and her family have been visiting the same pumpkin patch/apple orchard for years. 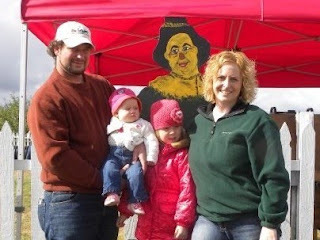 One of their family traditions is to have their family photo taken in front of the same wooden scarecrow each year. Like a lot of traditions, it's not complex, but it's memorable. The photo makes a great scrapbook page and shows how everyone changes over the years. This year they added a new baby to the family! Parents often wonder what to do with all the candy their kids collect on Halloween. I have finally found the answer thanks to "One Charming Blog." Not only does it make for a great new Halloween tradition, it's healthier too. Introduce your kids to the Great Pumpkin. 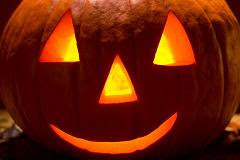 Here's the concept in a nutshell: the kids go out trick-or-treating, when they get home they're allowed to fill up on all the candy they can eat that night, when they're done, they package up the rest of the candy and leave it out overnight for the Great Pumpkin, in the morning an awesome gift will be waiting in return. Click on over to "One Charming Blog" for the full details. P.S. Now we know why pumpkins are often seen with few or no teeth... too much candy! Let's just say it's been awhile since I've posted to my blog... a long while! Since the last post a lot of things have changed. The biggest news is the addition of Baby Stella to our family in July. It seems that there are no better reasons to celebrate traditions than children and I'm so excited to reinvigorate Cafe Traditions website and this blog. While Stella won't appreciate traditions for awhile, my mind is already racing with ideas of traditions that I want to celebrate with her. I can't wait!! P.S. I'm madly in love with our new little bundle of joy.